Session 14 was a fantastic session to share the nuts and bolts of how to ignite the flywheel of better organic rankings, and more sales. This comes down to crafting a listing that meets the best practices and standards for Amazon search engine optimization. There is no better teacher to explain this than Scott Voelker of The Amazing Seller. Scott has that unique talent to take potentially complicated topics and distill it down into easily understandable concepts. He is one of those special teachers who confer knowledge and fuel ambitions at the same time. Before we get there, a quick update on Jungle Snugs: the first shipment is packed up and about to depart to the United States! There are 10 cartons being shipped by air, set to arrive on 5/31. Additionally, there are 3 samples (one of each variety) being sent to our photographer to get professional images. More on that in another post in the near future. Greg has an ambitious goal to be ranking for the top keywords for the Baby Hooded Towels by the end of June, so we were super stoked to get Scott on board to explain how this is done! The crux of today’s session boils down to this: give Amazon what they want, and they will help you sell your product. The first step of this formula is about creating the best listing possible. We covered the keyword research aspect of an optimized listing in a Session #11. As Scott emphasized, it is ever important to create a strong foundation to generate your initial sales. And, help convert visitors into customers. Amazon’s primary focus is to provide relevant offerings for any search query. Therefore, providing the most robust and thorough information is in your interest, as it helps Amazon match your product to relevant searches. How do you rank on page for your keyword? In the mix of various ranking factors, Scott notes that sales and relevancy are most important. Once you start to get initial sales, and rank for particular keywords, your sales will compound into more sales. Think of it like Amazon’s recommendation platform, “people who bought this also bought that”. Except in this case, it’s the algorithms that are determining the keywords in your listing, to help provide shoppers with exactly what they want, and your sales history and velocity. You need to prove to Amazon that your product is what people are searching for. You have now entered the flywheel of sales, the more sales you generate, the more likely Amazon is to show your product. Moreover, the increased exposure brings even more sales through the door. The basis of this lies in having an optimized listing. Include only the most relevant and high-volume keywords in your Product Title. Add high-quality images to your product, read: professional photos. This increases the likelihood that someone clicks on your product, and ultimately increases your conversion rate and sales. You can also include keywords in the filenames. Focus on the benefits that your product brings, as opposed to just the features. In the case of Jungle Snugs, the benefit is that it is soft and absorbent, the feature is that it is bamboo and organic. Shoppers need to know both but you should always lead with benefits. Similar to the Product Features (bullet points) above, but with more space to elaborate and create a narrative. You can weave even more supporting keywords into the description to help Amazon understand your listing, whilst also giving shoppers the benefits with which to fuel their purchasing decisions. Another opportunity to add relevant keywords behind the scenes within Seller Central (again, see Session #11 for more on finding the best keywords). Amazon uses these search terms to help identify your product and how relevant it is to a shopper’s search query. Scott highlights one simple way to gauge your main keyword. Browse the first page of results on Amazon to see what is most popular. This means that the other competitors are including similar keywords, and that the products that appear in the results are roughly those that you wish to compete against. Remember that relevancy is key. You want to ensure that you are appearing alongside your nearest competitors, and hopefully you will eventually outrank them in the search results. That’s not to say you should not also try to rank for tertiary keywords that shoppers search for, who may be interested in your product, but you need to really nail down your main keywords first and foremost. Scott covered the tactic of using PPC to generate search terms reports which you can then feed directly back into your organic Amazon listing optimization. This is one of the best ways to get real data about what people are searching for related to your product. 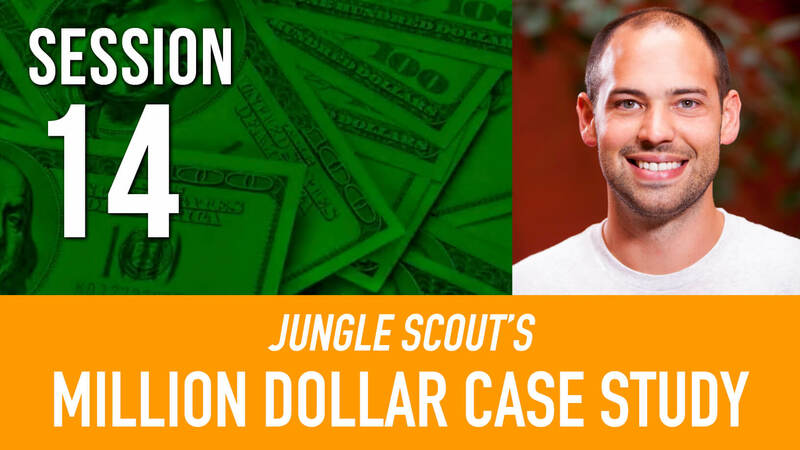 Of course, your PPC campaigns are also a great way to boost your sales, and can help with your product launch, as discussed in Session #13 of this case study. We have also published an article about using Amazon PPC specifically, to leverage more sales and boost your organic optimization. Check it out here! 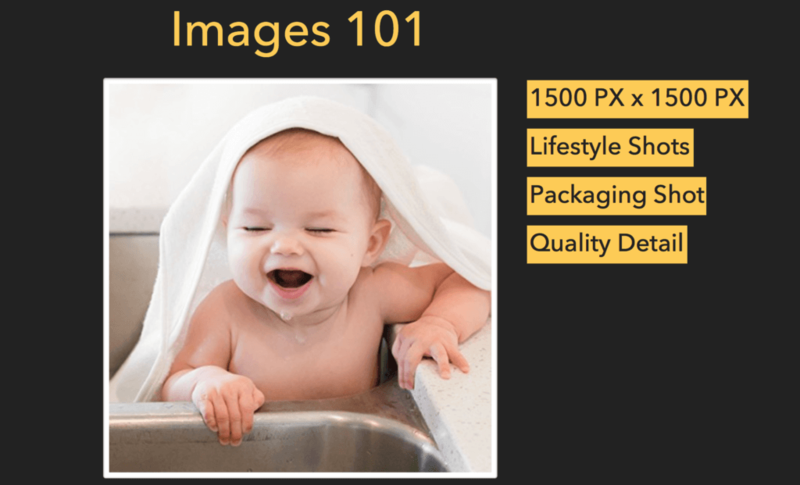 1500px x 1500px – Scott advises to use images with at least this size, so that you can leverage Amazon’s hover-to-zoom feature. This clearly helps customers get a better feel for your product, and ultimately improves your conversion rate. Lifestyle shots – Along with standard images of just your product, it is great to include additional images to show how your product is used “in action”. Including packaging is good – Especially helpful for those trying to position in the product in a premium niche, and if you have invested in high-end product packaging and design, including the packaging in a photo is a great idea. Show quality in detail – Including high quality images of your product is a great opportunity to showcase some of the finer details of your product. For example, stitching on the towels, the embroidery on the ears, or a the wash cloth that comes with a purchase of Jungle Snugs. We will take a closer look at Amazon product photography in more detail in another Million Dollar Case Study session very soon. Scott shared two great insights on improving the copy on your page. This will ultimately help convince your customers that they need your product, as well as help you rank for more keywords. People buy the products for benefits, not for the features. Remember, your customer is ultimately looking for a solution to their problem. There are likely going to be alternative options that they could purchase instead of your product, but you need to play up the benefit that they get solely from purchasing your product. Remember the famous marketing quote from Harvard Business School Professor Theodore Levitt: “People don’t want to buy a quarter-inch drill, they want to buy a quarter-inch hole!” Sell the solution to their problems with the benefits that your product offers! Amazon has revolutionized the concept of market research, for those willing to put in the time sifting through existing customers reviews. What are the issues that customers have with existing offerings? What would they like to see that doesn’t exist? These can all be great clues to product development. But there is also a benefit to copywriting, as Scott advises. You can use these reviews to nail down the exact language and terminology that your customers use. This is particularly helpful for products where you may not be in the target demographic. You can cherry-pick some of the best words, and use that language in your listing, to help connect with your customers and also possibly uncover additional relevant keywords. Focus on the basic optimization to lay the ground work for a successful product listing before making the push for sales (with promotions, pay per click, and product launches to existing audiences). Once the foundation of a good listing is established with an optimized listing, you are ready to focus on driving sales. Those sales will in turn improve your ranking, as you indicate to Amazon that you will convert visitors to customers, and that is a powerful indicator to Amazon! Ideally, you create a well-polished listing (relevant keywords, compelling copy, great images), and start converting, and ranking, on some of your most important keywords. The next installment of the case study is with Andrew Browne, Co-Founder of Splitly, to learn the data-driven process to get the best listing, with split testing. Make sure you head over for the full replay and recap! i just saw that junglee stix is now a “Amazon Choice” can you help me about how to get that badge or any hack you can help with? Interesting you bring that up. We may have actually discovered a cool way to do it. We’re testing it out before we start sharing it, but it could be huge. Stick with the blog for updates. Wow, you all provide some really valuable information on these sessions….and it’s FREE! Thank you. That is all. Thanks very much for the kind words, we do our best to provide as much value as possible! Great webinars! Just wanted to mention I’ve heard all of the webinars at work for both the junglestix and junglesnugs. I remember you mentioned I think it was webinar 12 or 11 that you were going to discuss the regulations/certifications for the baby products. Will you mention that in one of your next webinars? I know that you are currently looking into checking the amazon brand registry regulations as well which was another topic I’m looking forward to listen to. Thank you for all you do. We’ll be covering this in the session that is happening today (Wed 6/7 at 3P ET/12N PT). If you are unable to join, there will be a recap coming up later in the week on this page (it will be session #16). Thanks for the kinds words, glad you are enjoying the case study!